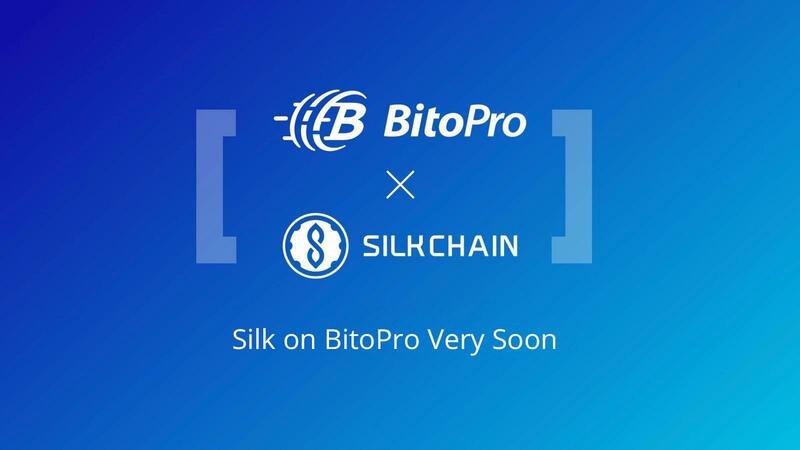 The SilkChain team is thrilled to announce that Silk will be available on BitoPro exchange. BitoPro is a digital asset exchange targeting global investors that was established by BitoEX that has provided the Bitcoin trading service since 2014 so that users can buy Bitcoin from thousands of stores in Taiwan. BitoEX has established the BitoPro on the basis of the advantages of a large number of users, Bitcoin-selling stores and successful experience of operating Bitcoin wallets and other trading services in Taiwan. BitoPro International Digital Asset Exchange is the biggest exchange in Taiwan and it can support fiat trading. BitoPro aims to establish a world-class blockchain asset exchange platform to provide global investors with a safer, more convenient, professional, trustworthy and excellent blockchain asset exchange service. In the future, BitoPro's business scope will include cryptocurrency and related derivatives trading services such as fiat trading, crypto-to-crypto trading, crypto-financing and leverage trading. BitoPro will also provide users with advanced digital asset management function, tools for risk management and platform-wide customer support, in order to meet each investor's investment needs. BitoPro focuses on the risk control and it has high level of stability. Meanwhile, BitoPro can provide the personalized services of AI Portfolio Digital Asset Management, Multi-Language Support, Multi-Platform Support and so on to meet the increasing market demand. As the first project in the world that dedicates blockchain technology to improving international trade and consumer spending ecology, SilkChain represents the most powerful one initiated by the largest members among all crowd-funded blockchain projects until now. Recently, SilkChain has released New User Reward Program, Ecological Incentive Program and Applications Candy Plan. In the future, SilkChain will push the process of the economic design and construction of the Silk ecological community to build an equal and mutually beneficial international trade ecology, achieve community prosperity, and share the huge dividends of ecological development with community users. The BitoPro's advantages of high volume and all kinds of personalized services are consistent with the needs of the projects and community members. BitoPro is one of many exchanges SilkChain will be working with and SilkChain will also push the process of listing on other exchanges. The updates about the listing date and the process of listing will be released through official website, SilkAll service groups and official telegram groups. Please keep focus on SilkChain announcements and updates.